Here’s what’s so exciting about our baby boomer generation – we’ve figured out we don’t have to accept the golden handshake and step away from life. Want to keep right on working? Go for it! Want to retire early and travel the world, go for it! Or, volunteer or become a gentleman farmer, or go back to school, or walk the Camino de Santiago! The world is our oyster and we’re here to hopefully help others redefine retirement. So far, we’ve retired twice. I think this time it will stick, but never say never. We don’t believe you have to have all of your ducks in a row before you take that leap of faith. Sometimes, you don’t even know the questions. But it’s a good idea to have a game plan. And, with our generation, creativity and thinking outside of the box (such a cliche) are a big part of that game plan. 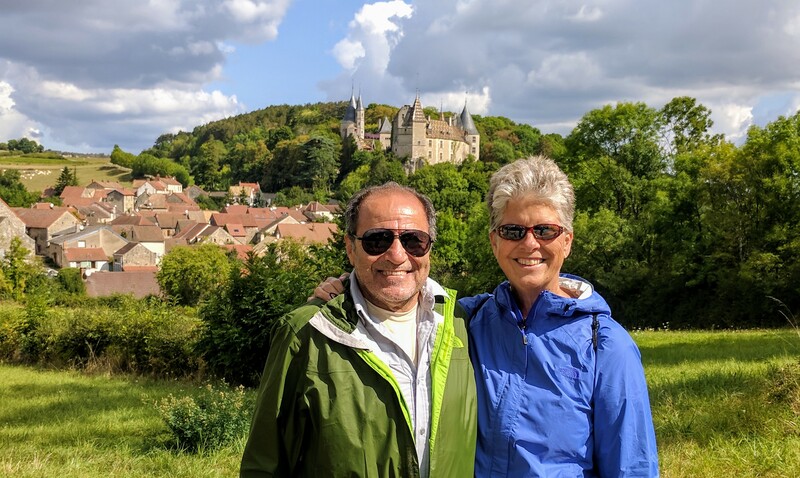 When we retired, for the second time, in 2014 we relocated from the west coast to the east coast and as we traveled across country, in a big yellow truck, ideas came to me about transitioning into retirement. Each idea was born out of a particular experience while on the road. At the time I wrote the list for fun, but as I look back on it, I think I nailed it. It’s a pretty good list, right? So here we are with our feet newly planted in retirement trying to figure it out as we go, which has led to the launching of this page; an on-going work in progress source of information for those looking for a little inspiration when it comes to redefining retirement. And it’s a place to share the stories of others who are breaking free from the culture of traditional retirement. So stop by from time to time to see what’s new. And, if you’re so inclined, leave a comment and tell us how you’ve defined your path of retirement. 1. There are just over 40 million Americans age 65 and older, and they make up 13 percent of the population. By 2030, when all the baby boomers will have passed age 65, the over-65 crowd will reach 20 percent of the population. At that time the median age of Americans will increase to 39.6 years, up from 37.2 today and a significant increase from a little under 30 in the 1960s and ’70s. I’m already semi-retired by choice and pretty happy about it. I wouldn’t want to be younger, I think things tougher than they ever were for younger people. Do I think about ‘retirement’. What is retirement? the word depresses me. We (because Spanky is the same age as me) are going to keep on travelling and having fun as long as we can, talking to people of all ages along the way. When we get to old we’ll have a couple of young hotties take care of us and when we really get too old I’ll go out in a dignified way, hopefully the laws will have evolved by then. But I’ll never be put in a box and categorized. Maybe one day I want to work part-time to connect with others, maybe I just want to lounge around and be a cranky old man. But for me there is no such thing as retirement…does ‘retirement’ just mean not working? As a “Middle Boomer” I’ve been working on semi-retirement for 22 years and lovin’ it. Only a couple years ago I realized I had nothing more than social security for retirement. Gave me a jolt and caused me to think, which I’m still working on. I love to play yet still embrace working as a seasonal Park Ranger, which is kind of like play anyway. Maybe I’ll become an expat in South Africa and do part-time, intermittent volunteer work while continuing to travel as I may/desire. I don’t see myself just hanging around waiting to die and want to Live each moment. Great info. I know us boomers are a glut in the population but not by how much. Every journey through life is different, ever changing along different paths. I continue to look forward to following your journeys. Thank you, Gaelyn! I admire the way you carved out your semi-retirement as a seasonal park ranger, you’ve really got the best of both worlds. And, I completely agree with your thought that every journey through life is different, along different paths. Deadly Secret by Joy Brighton on all platforms and in a book with real pages. Thank you, Linda! I love the way you think – and any excuse to travel to Paris, right?! I like your new page Patti, lots of great information. My husband and I are working towards early retirement or rather a change of lifestyle. We want to travel more and work less, but it has to happen at the right time and also it is important for us to feel that financialy we will be ok. I will keep coming back to your page for some good inspiration. Thank you, Gilda! I’m really looking forward to learning more and passing it forward. Retired after 36 busy years working on a weekly small town newspaper in Oregon. Don’t have near the money they say you need, but my house is paid for and I’m used to living on the cheap. Try to take a photo a day and write in a daily journal so the time doesn’t slip by without me knowing where it goes. So far trips with friends to Montreal/Quebec and to New Mexico, with family to the Oregon coast and multiple trips to visit kids/grandkids in Portland area. Am loving being retired, living alone and looking forward to the future. Am planning to host a reunion of college friends here in my beautiful little town in the mountains this summer and spending a month in Paris is still a goal. Love your list and have enjoyed your blog for at least a couple of years. Thank you, Elaine! I suspect the amount of money the experts tell us we need before retiring, prevents a lot of folks from ever taking the leap. I think it’s a matter of how we define, “enough.” I love that you take a photo every day, that’s such a great idea, along with the journal. I hope you get to spend that month in Paris! I semi-retired 10 years ago (where did that go?!). I’ve gradually eased out of being a lawyer by starting with part-time appellate legal writing for my old firm. This year for the very first time, I actually considered not renewing my law license—but after a bit of cogitation, I plunked down my license fee and re-upped, so I guess I’m still a “recovering lawyer”. My retirement planning is heavily influenced by the fact that it seems that Mr. Excitement won’t be retiring anytime soon. He is very motivated to continue his work as a cancer researcher and he enjoys it, so yay for him. The huge plus is that he has many invitations to present his work internationally and I am very happy to be a trailing spouse. (Last night I was the only spouse at a dinner for 12 scientists here in Madrid, Spain. I sat across the table from a Paris based researcher who has dual citizenship from France and Italy and who in the course of 15 minutes I heard speak 4 languages fluently: English, French, Italian and Spanish. He is currently studying Basque because his girlfriend comes from the Basque region of Spain.) We are, however, changing some things. We just purchased a down sized Center City Philadelphia condo, having already downsized once. One of my goals for 2016 is to figure out what I want to do with my blog. Of course, that was also my goal for 2015. 😉 Write on! (One of these years, I hope to meet you and Abi IRL). Thank you, Suzanne. It would seem you and Dr. (Mr.) Excitement have figured out a way to define your path as well. And since he enjoys his work and there are added perks – i.e. travel abroad – why not?! I understand the concept of re-upping your license, it took me a few years before I “officially” retired my teaching credentials. Once I did, I never looked back and I suspect you’ll reach that point as well. I predict 2016 will be the year in which we do the IRL thing! I found and fell in love with journalism, initially moonlighting while employed full-time as a psychologist in a research institute. That enabled me to hone the skills I would need to launch into a full-time career as an author, blogger, and journalist. As an empty nester with more time to travel, I think I’m the luckiest person in the world to have experienced these two entirely distinct and satisfying careers. Thank you, Irene. Kudos to you for finding two satisfying careers and finding a way to morph one into a life-long passion of writing! So I’ve been retired 2 1/2 years and occasionally “sub” for absent Principals in elementary schools. I don’t miss the “grind” one bit. It was extremely stressful and as a lot of retirees say, I am busier than ever (trying to improve my blog and continually learning about coding, websites, technology). I am loving what I am doing now: travelling, blogging, taking courses and although hindsight is 20/20, I wish I had discovered these passions before i became a Principal. I would have no doubt taken a different route. But, that’s in the past and I’m only looking forward now. Great reading other people’s perspectives on retirement! Thank you, Janice. As a retired teacher I can relate to hindsight. I taught a university course for 3 1/2 years and loved it. If I had known I would have skipped working with elementary-aged children in favor of teaching at the university. But as my good friend suggested, I would not have been as successful at the university had I not had the prior elementary teaching experience. It pained me to say so, but she was right. I am thankful for my somewhat short (by most standards) teaching career, but I do not miss it one little bit – especially, knowing what my teacher peeps deal with each day. Good for you for redefining your path! Thank you, Jo. I like your term “protire” rather than retire! I haven’t heard that one before. I think, also, for some of our parents they just couldn’t imagine any other way of living and change is so difficult for some to embrace. Loved your sentence, “Sometimes, you don’t even know the questions” because that’s what our life has been since we retired over 3 years ago. We started out thinking we’d live outside the US which led to 3 years as nomads traveling through many countries which has led to our current location in Portugal. Breaking our lifelong habits of one-year and five-year goal setting has led to the infinite possibilities that arise each week, month and year which are amazing. As long as we don’t tie ourselves down with too much stuff we’re free to see and follow what’s around the next bend! Thank you, Anita. It’s true, isn’t it? How can we possibly figure out every aspect when we don’t even know the questions to ask?! I think it’s why so many don’t take the leap, they are tangled in the unknown, which we think is the best part! Kudos to you for defining your path and wading your way through the paperwork of the expat lifestyle! Cook a little, teach a little, paint a little write a little and love a little. These was how I defined my retirement 12 years ago (I was 54) and I have done a lot of each one, except for paint a little which got replaced by photography! I have become a wife, a book has come out of my blog, I have taught in a university and 2 colleges, and cooked a lot for my hubby!!! And I will continue doing the same things. Plus the passion I share with my husband, travel…a lot! Thank you, Carol. A little bit of everything, right?! Who says we have to stick with just 1 thing, 1 passion?! And, kudos to you on your book! You’ve definitely defined your path! I’m one of the Baby Boomers who lost my job in the recession and was not able to find another one in my field ( too old, too expensive, etc.) So after a couple years of consulting I moved from Boston to Florida (to be near my sister) and for the last three years have been combining my former career of marketing with my passions for writing and travel and have fairly successfully reinvented myself! I’m a travel blogger and also do freelance travel writing as well as having a regular gig at a regional magazine. It’s a nice life if a less financially secure one and I”m loving my second act! Thank you, Kay. That whole “too old, too expensive” excuse really hit a lot of baby boomers. I’ve always believed though that life is what happens to us while we’re busy making other plans. Kudos to you for finding a way to successfully redefine your path. I’ve been retired for 3 years now, my husband for 3 1/2, and I think we’re still defining what that looks like. The great thing is being open to things, knowing one year doesn’t need to look like the previous. We’re doing a bit more traveling and have spent winters as snowbirds getting away from our cold prairie winters. I’ve taken up blogging and am enjoying being able to spend more time writing. We’ve downsized to have less home and yard to look after so we can devote time to other things. I think baby boomers are generally lucky to have more options than their parents did, but I also had some excellent role models in family members (aunts, uncles, my grandmother) who took up other passions in older years (painting, horse raising, ceramics). Thank you, Donna. I love this thought, “The great thing is being open to things, knowing one year doesn’t need to look like the previous.” It’s so true! We have so many options open to us. Haven’t really retired, just a huge life change once the kids were all out of the nest. Sold our house and took off on the road in a beat up old motorhome. Writing about our adventures has led to exploring all over the world and then opportunities to write about that. Later a book, Going Gypsy, and now working on another one. Quite a life, but awfully busy to be calling it retirement. The GypsyNesters recently posted…How to Get Trapped in a Giant Crater with Wild Animals – and Love it! Thank you, Veronica. Definitely, the two of you redefined your path once your kids left the nest. You embraced the opportunity to shake it up and take on a new chapter. Speaking of chapters, congratulations on your book and soon-to-be book! Finding the best retirement plans should include professional tax advice. The consequences of poor retirement planning can be large tax liabilities, at a time when your income is needed the most. Some plans utilize pre tax contributions that are taxed upon distribution, while other plans use contributions made on an after tax basis so withdrawals are not taxed after retirement. Tax advice can help you choose the right plans for all of your retirement needs and goals. William Lyons recently posted…What Would the Repeal of the Federal Estate Tax Mean for Estate Planning?